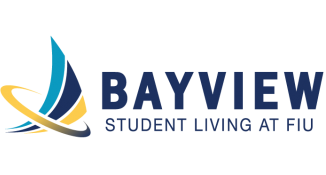 Bayview Student Living at FIU is located on FUI's North Miami Biscayne Bay campus. This student housing community offers an academically focused environment that helps students learn and grow outside of the classroom. Our social and educational events allow residents to make new friends within their apartment community and campus. 24/7 onsite staff with 24 hour emergency maintenance ensures our residents can focus on their studies. Our modern student apartments offer private studio, two bedroom and four bedrooms options which include kitchens with granite counter tops and stainless steel appliances, a designer furniture package, hardwood plank flooring, walk in showers with built in benches, and optional meal plans.